And then the killing begins. Gruesome deaths that lead the Doctor and his friends to discover the grisly truth behind the academics’ plans, and ¬ as the ghosts of the past become ghosts of the present ¬ to recognise that sometimes death can be preferable to life. Sylvester McCoy is the Doctor in Night Thoughts. Four teachers, long-time professional and personal colleagues, are spending a winter break from the university in a remote mansion on Gravonax Island, a bleak Scottish rock where nerve gas had been tested during the Second World War. An incoming storm traps the quartet…along with three newcomers, one of which swore they saw something floating just under the surface of the island’s lake. When one of the teachers turns up dead, an investigation by the Doctor, Ace, and Hex uncovers the truth behind the relationship between the surviving friends. Why is one of them hiding her studies into time travel? Why is another so interested in his departed friend’s efforts with taxidermy? What horrible accident went on 10 years ago in the upstairs laboratory? And what does it have to do with the young maid, who clutches at a beaten and battered toy rabbit who acts as her mouthpiece during times of stress? …seriously, I’d love to read it. I’m not as well versed on poetry as I’d like to be. As I listened to Night Thoughts, it was only natural that the televised story Ghost Light came to mind. Both are set in remote manors populated with slightly-off residents with a hint of supernatural and scientific mysteries, and both require the audience to pay a little more attention than normal to fully grasp the plot. Of course, both also star Sylvester McCoy and Sophie Aldred. Young’s script does a great job in setting the stage, with figures floating in the lake, stuffed and mounted creatures littering the manor walls, and an operating theater in the attic, and makes it all just a little creepier by the resident of the manor taking all of it at face value. Add a mysterious assailant who whistles “Apples and Oranges,” the potential to send messages backwards in time, and a repeatedly used recording of the Doctor saying “won’t you come into my parlor, said the spider to the fly,” and you have a story that absolutely DRIPS with atmosphere, spreading out the moments of horror to make the characters come alive with how they deal with them, some by resignation and some by attempting to take charge. One can definitely sense the television influences in the script, such as the large number of stuffed and mounted animals and several creepy locations such as an attic lab, a basement, and a chapel in the woods. There are some parts that don’t quite fit, however; one of the characters, Sue, carries a stuffed bunny rabbit that’s been loved to the point of falling apart. In times of stress, the rabbit “speaks” for Sue, ala Danny’s finger from The Shining. It’s a plot device that doesn’t quite work as well as it should, as the voice of the rabbit is just off enough for the listener to go “ooooooooooh kay,” as opposed to “ok, that’s a bit weird.” The larger problem, however, is the lack of payoff to some of the story’s key moments. A character dies at the end of the first episode, and his passing is pretty much treated as “our colleague is dead. Oh, well, put him in the deep freezer until the police arrive.” The location of the killer is deduced by the survivors…but once that plot point is settled (in a very “oh, that’s just not RIGHT” manner), the characters shrug and go “oh, well, the true villain is indisposed, time for us to leave.” And the second-to-last scene is the Doctor explaining everything to Ace and Hex as they walk back to the TARDIS. It’s a good summation, but it felt very anti-climatic. The end of the story is the definition of karmic justice and very disturbing to listen to (thanks, sound guys), but this gruesome scene would have been better served with just a bit more payoff and a sense of conclusion beforehand. Sylvester McCoy’s first audio, The Fearmonger, could have come right out of Season 27, with political overtones, a series of moral gray areas, and excuses for horrific actions quashed by a Doctor who’s heard it all before and believes none of it. In many ways, The Fearmonger is a spiritual successor to The Happiness Patrol, and in that vein Night Thoughts is the spiritual successor to the story I mentioned earlier, Ghost Light. While the Doctor in that story is drawn to the manor house because Ace was compelled to burn it to the ground when she was younger, the TARDIS crew ends up on Gravonax Island due to what the Doctor describes as a “psychic distress call,” backed up by some weird dreams that Hex had the night before. This plot point isn’t brought up very much during the story, serving only as the reason the Doctor has shown up, but I hope Hex’s dreams become a plot point in future audios. Beyond that moment, though, Night Thoughts is peak Seventh Doctor in terms of being inquisitive, mischievous, and pulling all the pieces together before anyone else realizes there’s a game being played. McCoy plays the part to the hilt with his quiet conversations, bringing up minor plot points in such a way that only he knows just how major they’ll become, utilizing his companions in the best way possible, and even taking part in the experiments being run on the island knowing full well the end results. This is what was missing from LIVE 34, seeing just how the Doctor operates and how he comes to his decisions. And at the end, where there’s a decision to be made between a human life and the Web of Time, those of us who know the Seventh Doctor hold our breath as we wonder just what it is he’s going to do. It’s what helps makeNight Thoughts one of McCoy’s best Big Finish performances to date. It seems that Big Finish dropped the “Dorothy” angle in recent audios, which is a bit of a shame. Teenagers can have the nickname of “Ace,” not men and women old enough to drink! Sophie Aldred’s Ace is much more the “older sister” in this story to the “younger brother” Hex than in previous audios, and on the flip side, there is a bit of a “crush” on Hex’s part towards Ace, which is completely understandable (it’s Sophie Aldred!) and dealt with in a future audio in a very quiet and downplayed manner. But here, Aldred and Philip Olivier work very well together, in terms of needling, joking, a bit of light flirting, and stepping up when the situation calls for it. Ace takes her share of mental, physical, and emotional lumps in this story. 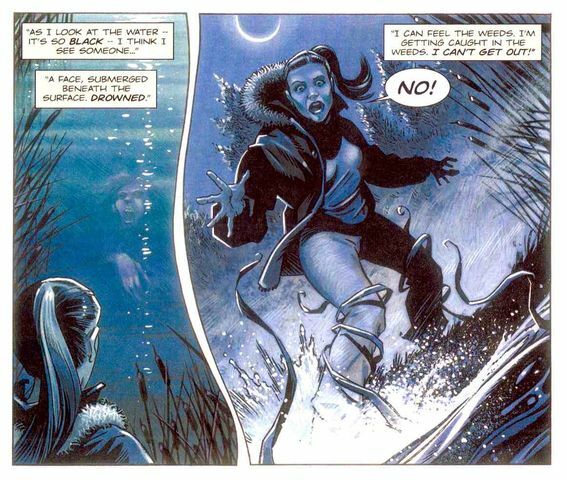 Not only does she see a specter floating in the lake, but she gets into a fight with the story’s assailant, who stabs her with a syringe (Ace moans “that’s not fair” in a funny moment), as well as almost getting her leg crippled via automatic bear trap, let alone being trapped with the Bursa in a darkened room with a killer in a situation that harkens back to Five Nights at Freddy’s. Through it all, Aldred plays Ace as more aware of her surroundings and less flippant, but still flippant, hitting just the right amount of flippant, for the story, making light when the moment is tense and springing into action when the moment is right. Night Thoughts gives us a Hex who’s already seen a few things during his time with the Doctor, so the “oh my God” aspect of his character is gone, replaced with a young man who still has his curiosity. With Ace being the jaded time traveler and adventurer, Hex has become the “everyman” in the TARDIS. He’s someone who might not understand what’s going on because it’s alien to him, but he’s going to do his best to live up to his medical training and help out in whatever way he can. I know I keep banging this drum, but in three-and-a-half stories Hex has shown himself to be a much more relatable and enjoyable character than C’rizz, and it’s a drum I’m going to keep banging every time I hear Philip Olivier’s Scouse accent. We see Hex’s curiosity as he hears a noise downstairs and goes to investigate (as opposed to Ace just trying to get some sleep), his humanity as he tries to get Sue to open up to him about her past, and his quiet anger as he proclaims to the Major just how wrong he is. And, in a moment that brought the Brigadier and the Master to mind, Hex punches out the Major to end his part in the story. Olivier has made the part of Hex his own, and this story easily showcases how solid a casting choice he’s been for Big Finish. The supporting cast all get their moments. Bernard Kay (who is sadly no longer with us) starred in several televised serials alongside none other than William Hartnell, and plays Major Dickens as the stern military type. There’s no mustache twirling or scenery chewing on the part of Kay, but the by-the-book, follow-my-orders, my-way-or-the-roadway mentality comes through, even though it’s obvious his Falklands-era theatrics are no match for the Doctor. Joanna McCallum is the character who spills her personal secrets as well as the mystery behind the group’s activities. Her impending demise is one of the more tension filled scenes in the story, a mix of terror and grief in her final words. The Deacon, played by Ann Beach, has a horrific death scene, made all the worse later in the serial where she has to read her own suicide note! Andrew Forbes, also known as Omril from the Fourth Doctor serial Full Circle, plays Dr. O’Neil, who is driven to find out what happened on the island and how it relates to his past. That past also ties into Sue’s past in a way that is a bit clichéd, but is worth the small emotional payout that we get from Lizzie Hopley. Hopley plays the shuffled around foster girl turned maid solidly, though her attempts to talk with the bunny come off as just a little corny as opposed to just a little creepy. Gary Russell does a fine job as director. The story could have used a bit of trimming in terms of dialogue, but all three cliffhangers come off well (the third act one’s a bit of a breath stopper) and the action, even if it keeps a slow-and-steady pace, moves along from scene to scene. The “fight” scenes, especially the one between Ace and the assailant is a particular stand out. As always, the sound crew throws in their two cents and turns it into a dollar. Anthony Jenkins gives us a remote manor in Scotland, with a storm outside, a chair lift inside, and all the little creaks and noises that come with an old house. There is one weird thing that really bothered me… for some reason, I kept hearing a meowing cat in the background. I don’t know if it was the production crew trying to establish outdoor wildlife, but I swear it sounded like one of my cats when he’s accidentally trapped in the closet. It was the same noise looped over and over again, just at the lowest volume. Where I have to give credit to Edward Young is how he weaves in the science fiction elements in with the horror. It’s established very early that a primitive form of time travel is involved in the events on Gravonax Island, and that time travel is meant to fix a horrific mistake. Does one life really mean the Web of Time becomes fractured? While it serves as the explanation for the supernatural, the truth makes what’s happening even more chilling. If someone is dead in the past, but someone alive, even for a moment past their allotted time, what does that mean for the future? Can someone be alive and dead at the same time? How does Time deal with such a paradox? And more importantly, how does the PERSON deal with it? I like the answer in terms of “that’s twisted and kind of brilliant,” but it also sent a bit of a shiver down my spine. It was a very good way to explain why, once time is set, you can’t tamper with it, because the ramifications would be severe. And if you’re going to tamper with time, then the Seventh Doctor is the best choice to tell a story about why it’s a really bad idea, especially when karma comes knocking at the very end. Night Thoughts has its flaws, with some attention needed to the payoffs and a bit of trimming needed to the dialogue. But it’s a damn good story nonetheless. It’s creepy, it’s atmospheric, the plot twists back on itself, and it asks some thoughtful questions about time travel and if one could ever truly right a wrong. And most importantly, it can leave that little feeling of unpleasantness at the top of one’s spine, that feeling that makes you shudder and pinch your shoulders just a bit. This one’s definitely worth seeking out, and perhaps best listened to on a rainy night with a cup of tea in one’s hand. Just keep an eye out for the stuffed animals. Synopsis – Conjuring memories of Ghost Light, Night Thoughts is an enjoyable but unsettling tale, mixing atmospheric horror with the consequences of meddling with past events. 4/5. Paul McGann is the Doctor in…Time Works. This entry was posted in Big Finish Review and tagged 4/5, Ace, Big Finish, Big Finish Audio, Big Finish Review, Doctor Who, Doctor Who Audio, Doctor Who Review, Hex, Philip Olivier, Seventh Doctor, Sophie Aldred, Sylvester McCoy, TARDIS. Bookmark the permalink. Nice to see a detailed analysis of this one! I’m pretty unapologetic in my love of this story. It’s flawed (the dialogue definitely falls flat in places), but I’m fully willing to forgive the flaws for all of the story’s strengths. I’ll be curious to know how the next few reviews will go. This is the beginning of my favorite run of Big Finish stories, so I’m always curious to know how others respond to these tales (I have no idealizations you’d think the same as me, but differing opinions are part of the reasons I read these reviews!). Especially since there are some really unique stories coming up.